Congratulations to Maestro Hans Graf as he completes his grand tenure as the music director of the Houston Symphony Orchestra. And his grand tenure will be completed in grand style with his conducting the popular second symphony of Gustav Mahler, known as the Resurrection Symphony. This lengthy 5 movement symphony contains a choral in the final movement [a la Beethoven's 9th symphony]. 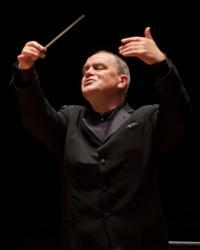 Hans Graf is very familiar and lover of Mahler's music and is the perfect maestro for his resurrection symphony. Mrs. B and I are really looking forward to this symphony and showing our love and appreciation of Hans Graf and his tenure in Houston by giving him a rousing ovation. Sheralyn and I always love going to Jones Hall to hear our Houston Symphony-tonight, though, will be a special one. This will be like going to an epic movie. As this is a lengthy 90 minute symphony, this will be the single piece on the concert program. Because this will be Hans Graf's taking the baton for the last time as the music director, I am sure there will be some video in tribute of Maestro Graf before he enters to rousing cheers. Mahler's Resurrection Symphony begins with a movement marked Allegro Maestoso that is filled with drama. It contains a funeral march. The slow second movement marked Andante moderato represents a remembrance of the joyful times of the deceased. The third movement is a scherzo containing references to Jewish folk music. The fourth movement is a song, sung by an Alto which leads to the very long final movement with chorus. "The final movement opens with a long introduction, beginning with the 'cry of despair'." "The development section is what Mahler calls the 'march of the dead'." The chorus comes in a little past the halfway of the movement. This dramatic piece ends in a powerful, triumphant climax. Maestro Hans Graf will be going out in grand style indeed conducting this epic symphony. Once again Tales would like to congratulate Maestro Graf and wish him all the best in the future. Please turn up the volume to hear the ending of the final movement of Mahler's Resurrection Symphony.